Learn from Russ Harrington FREE* with TPPG! TPPG MEMBERS GET TO GO TO THE RUSS HARRINGTON FPP SEMINAR IN NOVEMBER FOR FREE*! If you are a Tallahassee Professional Photographers Member, this is your lucky day! 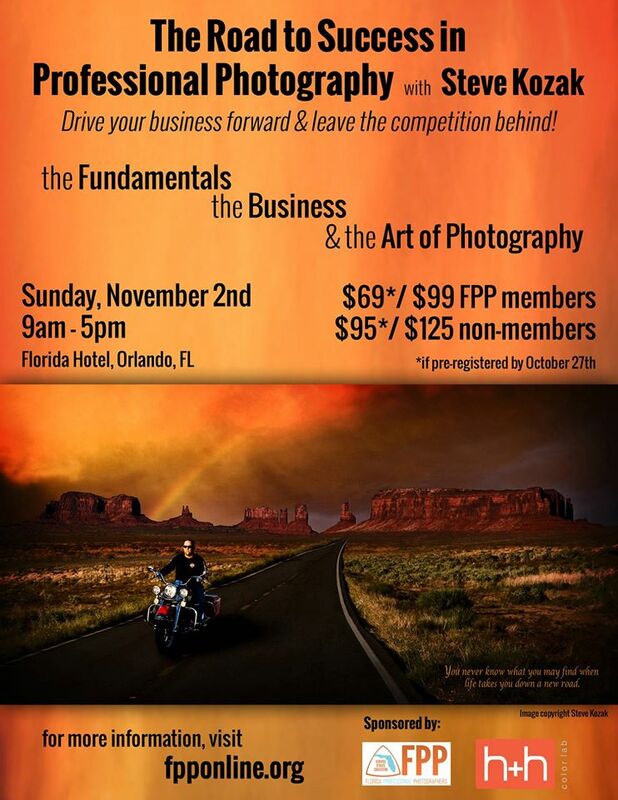 TPPG is paying for YOU* to go to the Russ Harrington Beyond the Speedlight Fall Seminar put on by the Florida Professional Photographers! You must fulfill the following requirements to qualify. 1) You must be a current member of TPPG by October 10, 2016. 3) You must be available to be in Orlando Sunday, November 6, 2016. You are responsible for your own transportation and hotel. TPPG is ONLY paying for your admission to the seminar. *If you are not a member of either organization but ARE a member of TPPG, then your discounted group rate is $109. TPPG will cover $79 of your ticket and you will pay the remaining $30 payable to Tallahassee Professional Photographers Guild. Cut off to register and claim your ticket is October 10th. Please only register if you are sure you can attend. Fill out the form below to claim your spot! NON PPA/FPP Members please pay $30 using the Paypal button below. We look forward to you going with us in November! Big news from Orlando! 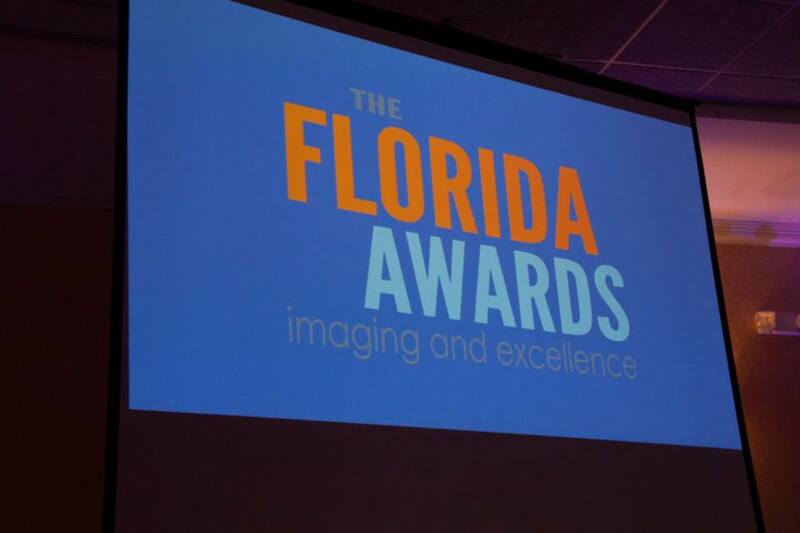 Members of the Tallahassee Professional Photographers Guild have just returned from FOCUS, the Florida Professional Photographers Annual Convention and Print Competition. This year ALL of our members who entered print competition came home with merits, making Tallahassee the #2 ranked photography guild for print competition in the state! Way to go TPPG! It also was announced that our very own Cindy Strickland will be our new FPP President! Congratulations, Madame President! 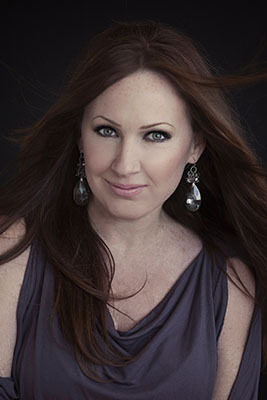 Linda Long was ranked as one of Florida’s Top 10 Photographers. Her image, “One in Every Family” received a Distinguished Award and an ASP Distinguished Award. She also earned the Outstanding Service Award for her service to TPPG! Steven Saccio placed first for his image, “Opening Act” in the Social Event Open Category as well as Best in Show for Social Event. 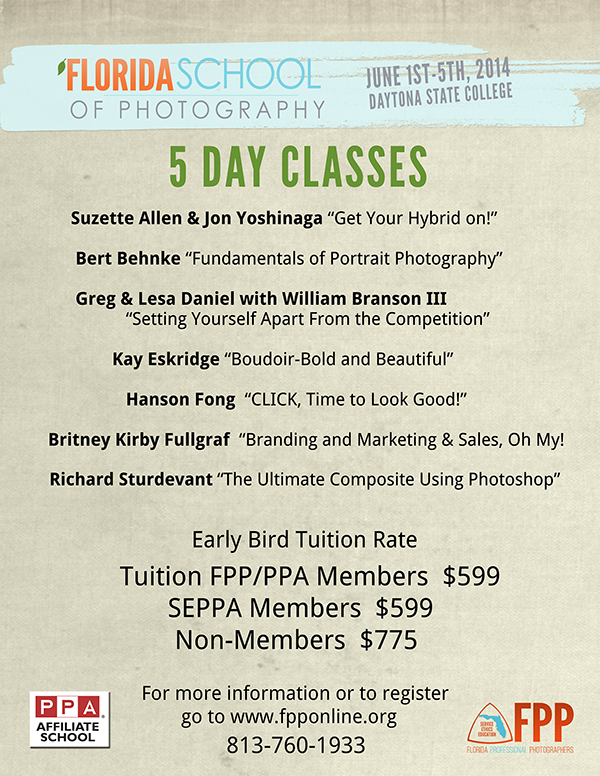 Florida Professional Photographer’s Florida School is happening June 7th-10th in Daytona, FL. Four and two day courses available. 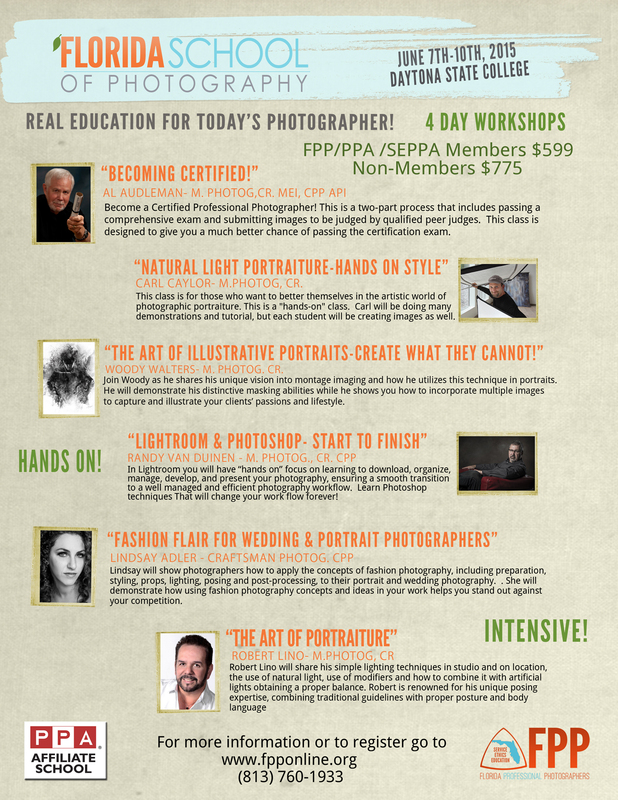 Check out the information on the 4 day instructors below and for more info visit the Florida Professional Photographers Florida School. 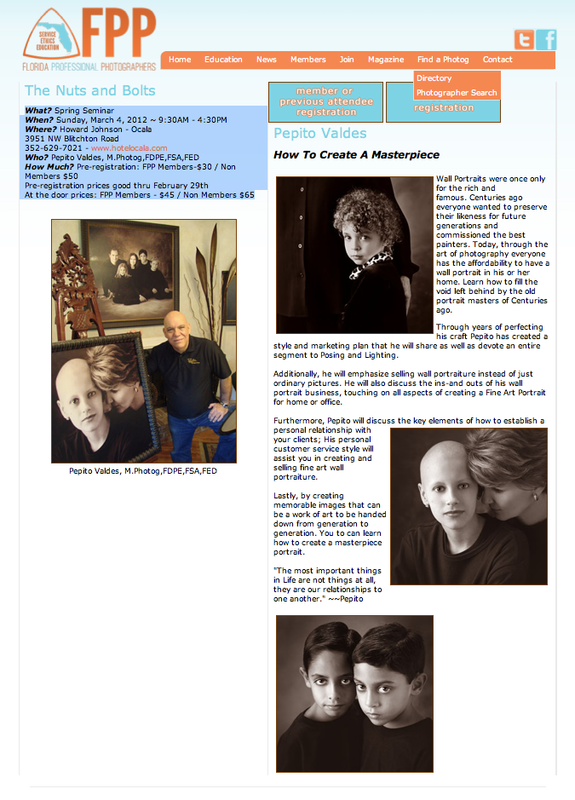 Florida Professional Photographers – Florida School is coming up this summer! Don’t miss out on this opportunity to get some intensive education from some of the greats! Find out more at FPP’s Website. How Much? $59 for FPP Members by October 31st / $79 for non-FPP members by October 31st. Add $10 if registering AFTER October 31st. Why? Because it’s HOT and this program is gonna SIZZLE! Spend a day learning boudoir from one of the industry’s most talented boudoir specialists, Stacie Frazier. PPA attendees will earn ONE PPA EDUCATION MERIT! The August TPPG monthly meeting and print competition is this week and we have an awesome program lined up – You won’t want to miss it! LOCATION: Our August meeting will be held at El Jalisco on Apalachee Parkway, 6497 Apalachee Pkwy, Tallahassee, FL 32311. EVENT INVITATIONS NOW ON FACEBOOK! – Don’t forget to RSVP to the August TPPG meeting invitation on Facebook! This is a great way to remind yourself about the meeting and a fun way to see who else will be attending the meeting. 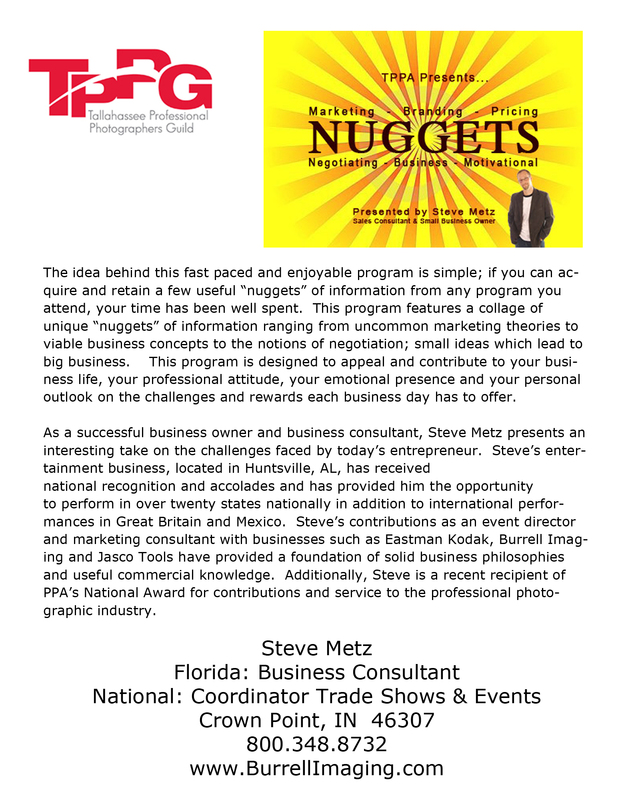 JULY SPEAKER INFORMATION: STEVE METZ IS COMING TO TALK TO US ABOUT MARKETING! The July TPPG monthly meeting and print competition is next week and we have an awesome program lined up – You won’t want to miss it! LOCATION: Our July meeting will be held at El Jalisco on Apalachee Parkway, 6497 Apalachee Pkwy, Tallahassee, FL 32311. EVENT INVITATIONS NOW ON FACEBOOK! – Don’t forget to RSVP to the March TPPG meeting invitation on Facebook! This is a great way to remind yourself about the meeting and a fun way to see who else will be attending the meeting. JULY SPEAKER INFORMATION: Olis Garber – 2011 FPP Photographer of the Yearwill be our guest speaker. He will share his tips on shooting wildlife, landscapes and outdoor portraits as well as share some of his post production techniques. DON’T FORGET TO BRING A PRINT FOR PRINT COMPETION! CLICK ON THE FLYER BELOW TO GO TO THE FPP WEBSITE FOR REGISTRATION! Another great Florida Professional Photographers Convention has come and gone, and once again it was a great event! We had a bunch of our TPPG members attend and volunteer… thanks for giving Tallahassee such a good showing. Congrats to all the Tallahassee Professional Photographers Guild members who merited in another tough year of competition. A special congrats to Linda Long for receiving the FPP Service Award for the TPPG Section, and to Gina Weaver for her Distinguished Award for one of her prints! Both are high honors. To get more information on number of salon entries, etc., check out the FPP page of this blog for a message from the State Salon Chair.